For Sale: Red October Sail Markings Shirts (and Buttons)! Based on my meticulous replica of the Red October’s sail number and markings. Not cold and hard, but soft and comfortable, comrade captain! 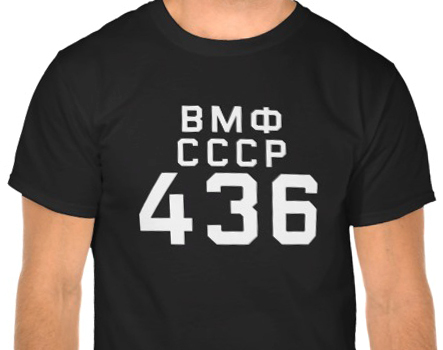 Author Staff WriterPosted on September 9, 2015 Categories DesignTags Advertisement, Cyrillic, Marko Ramius, Pin, Red October, Russian, Shirt, Soviet, The Hunt for Red October, Tom Clancy, ZazzleLeave a comment on For Sale: Red October Sail Markings Shirts (and Buttons)!